CES 2012 has just finished and I came across the challenge “SmokedByPhone” [REF-02]. You can watch the videos on YouTube [REF-03]. The challenge results are interesting, specially for a phone OS which have only about 1.5 % of the global phone shares market (see my previous entry on that). => 88% wins. Not bad !! Let’s see by the end of 2012 where Windows Phone will be – Nokia and HTC launched this week new phones in USA, that should boost Windows Phone sales and shares market. Ok, I might seem a bit too “Pro-Windows Phone”, but I do think that Microsoft has done a tremendous OS for the phones, specially around the “people hub” for communicating with people and social networks. People should have a try at it before buying their new phone! [REF-01] Microsoft CES 2012 Gallery page . 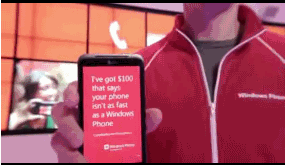 [REF-02] “Smoked By Windows Phone Challenge at CES 2012”, by Ben Rudolph, Windows Phone Team blog, 12-Jan-2012.